Through adaptation to an aquatic environment, underwater life often differs greatly in appearance from life we are used to seeing on land. May creatures only appear to look like plants or inanimate objects. Using them as "toys" or food for other animals can leave a trail of destruction that can disrupt a local ecosystem and rob other divers of the pleasure of observing or photographing these creatures. Consider enrolling in a PADI Underwater Naturalist or AWARE Fish Identification course. This course will introduce you to the most common fish families and species found in temperate and tropical waters. You'll also learn basic fish identification and scientific survey techniques as well as how important personal involvement is in aquatic conservation. Contact us for more information or email info@godiving-malaysia.com. Learn about the underwater world without impacting on it!!! 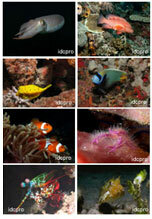 Enroll on the PADI AWARE Fish Identification Specialty Course with us today, and make friends with the fish!! !